I have had a rather steady two weeks at work. However, my weekends have been rather interesting. 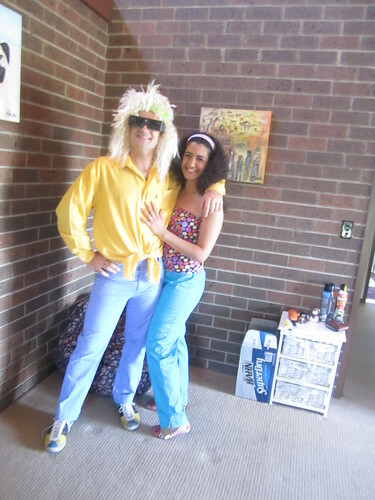 Last weekend I threw Alana (my colleague at work) an 80’s dress up farewell party. She is off to the UK in February and I will miss her heaps. 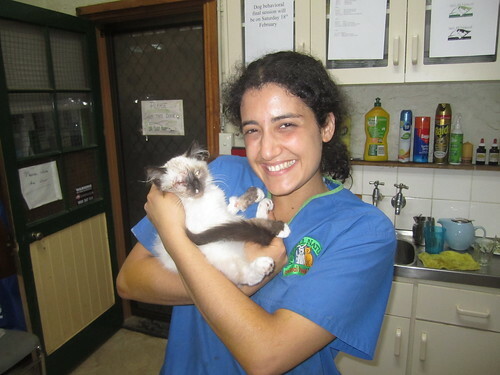 We have a great vet working relationship and have also become close friends. It has also been stinking hot here and that explains the rather cruisy work schedule. I think everyone is trying to keep cool and keeping their pets out of the heat. However, whenever I run out to do some grocery shopping, I am often shocked to see many people happily walking around with their pooches at around mid day (peak heat). I know the owners have good intentions and want to spend quality time with their dogs. Unfortunately, they seem oblivious to the fact that their pet is actually suffering in silence. These dogs are often lagging behind the owner and appear like they are cooking and in a bit of discomfort. Their poor paws must be aching and throbbing from each step they take on the burning surface beneath them. Have you ever tried to walk bare foot on the side-walk between 11 a.m. & 2 p.m. during the summer heat? I implore all pet owners to rethink taking their dogs out when it’s very hot unless they are heading to the lake or beach or park. Geriatric patients especially ones with medical conditions like heart or liver disease won’t cope with the heat. It is best to keep them indoors with a fan or air conditioner switched on. 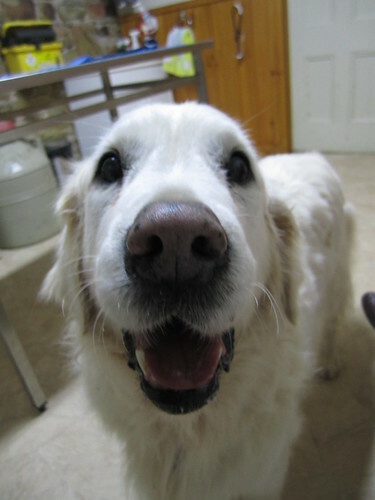 Unfortunately I had to put down one of my favourite patients ‘Castro’ ,a 12-year-old labrador, with heart failure because he was suffering from heat stroke. Boy did he love his liver treats. He would hobble around on his stiff hind legs quite happily just to get closer to the liver treat jar. 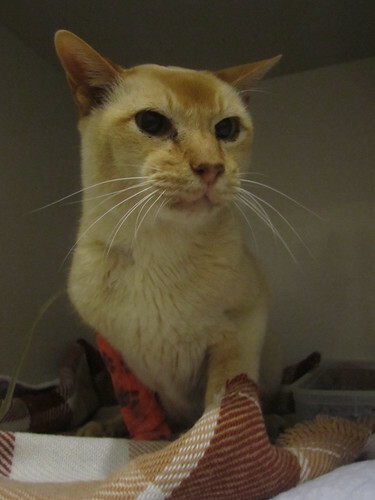 Last week, I was very lucky to meet George, 19-year-old Burmese cat, that presented to me for weight loss and intermittent vomiting. Yup you heard me 19 years old! His owner had already resigned herself for the worst possible news purely based on his age. George was so vocal and his coat was so smooth and soft. He was an absolute smooch. ‘I am successfully managing a 21-year-old feisty kitty cat with hyperthyroidism (overactive thyroid) and so I am more than happy to give George a good go”. I told her I am fully aware he is quite old and he may be suffering from a serious condition. However, I only base that kind of decision on the quality of life of my patient, my examination and workup. At that stage, the owner was quite relived and keen to take me up on my recommendations of blood work and admitting George into the hospital to get him started on iv fluids to correct his mild dehydration. The blood test was to rule in/out kidney failure or hyperthyroidism to help me decide what was best for Georgy. 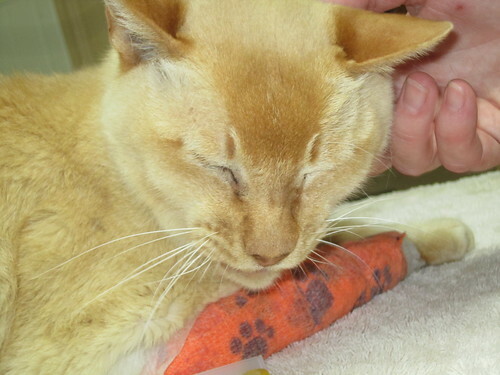 His blood results showed very mild kidney issues and his thyroid levels were normal. I was blown away with his good results in light of his age and quickly informed his owner. I then had to get the owner’s consent to go ahead with a general anaesthetic and dental. She knew well the risks involved but wanted to give ‘George’ the best quality of life while he was still plunking along. ‘George’ was initially not too pleased to be kept hostage in a cage. He kept yowling for attention and as soon as he got it, he was utterly contented. He made an excellent recovery after his dental. 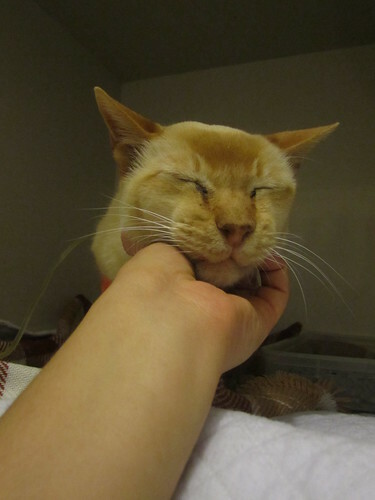 I called his owner a few days after ‘George’ was discharged and she was ecstatic to share the news of him thriving after his dental and not having vomited once. It was such a relief to hear that. For all you pet lovers who have been advised that your pet is too old to undergo a general anaesthetic. I recommend you take your pet to another vet for a second opinion. Can you imagine having a rotting and aching tooth or even set of teeth in your mouth? It is not only very painful but also will lead to bacteraemia (bacteria overload) that will spread through you pets’ blood stream leading to heart and kidney disease. Yes older pets undergoing a general anaesthetic have higher risks but it is definitely worth it. I find that many of my clients that have given me the okay to do a dental on their aged pets are always very thankful. They call to tell me they see a huge difference in their pet afterwards: more active, better appetite and simply their beloved pet is so much happier. So please don’t ignore your pet’s dental needs!!! Thanks for the ping back. The party sounds fun and I love the wild hair. I enjoy reading your stories about the dogs and cats and am sorry for the loss of Castro. I’m so happy George is doing well!!!! Yay! George is one resilient smooch. Castro was a trooper and will be missed heaps. Her Sherri. Castro was a much loved senior pet. His owners did everything responsible to keep him cool but his heart was the main issue. He was suffering from heart failure & was on several medications to manage his condition. Unfortunately, his heart could not cope with the pressure bestowed upon his body from the heat. I find extreme weather pushes my geriatric patients into shutting down :-(..
Good voyage, Castro. Beautiful dog. It always hurts to lose one. I had a ‘volunteer’ Abysynian cat who lived to 22. ‘volunteer’ because she dropped in one day at about 9 months old. Pregnant and beaten up by other cats. After she was patched up she never again had any health issues. Of course I gave her a home. Wonderful cat. She left me one Christmas curled up beneath the tree. As always love the pics of the animals, I would like to swap George, for the “stray” that has been living like royalty around here for about 14 years..She only has a charming personality when she is in want of something. Hey Jake. George is quite happy with his owners because they obey his orders 🙂 … Cats just love to rule our world! George looks like a very fine fellow and what a relief his teeth were the only problem. Do look forward to hearing all about Sky. Is she a Rag Doll? Hello there :-). Ditto your George comment. Sky is a ragdoll cross, her mom was a pure ragdoll. Such sad news about Castro, he looks like a beautiful dog. George looks adorable, and what great news for the owner, glad to hear everything went well for him. Hey mags. Thanks for soothing my concerns and letting me know queenslanders are switched on about walking their dogs in the heat! I just let out a big sigh of relief****I hope more pet owners become aware…Castro is at peace now. His beautiful & bubbly nature will be missed. As for George, I’m sure he is being pampered heaps at home. Castro looked good for an old dog; was his heart failure because of getting heat stroke? RIP big boy. So glad to know that George came through his dental surgery with flying colours. His owner must be so relieved. Thanks for the pingback Rayya! Awww, thanks Rayya, but the feeling is mutual. Your blog is so interesting to animal lovers, but it also has humour, compassion and education so we can learn more about our pets – and that’s priceless. You have so much to offer in each post, so I re-post yours often, and everywhere I can! 🙂 ohhhh…we are getting all moochy now, aren’t we!hehehehe….It is just amazing to have established this great blogging relationship with you and I hope it continues. Yep – I have no doubt that your hair can get – lets just say “Big”, but you’re right, but you’re right, you have contained it nicely in the photo above. Thanks for doing the client write-ups again, I always enjoy reading about your clients, and I must say, you have a very interesting client list at times……. Aw I so love to read your blogs Raaya. Sampson will be eight this year and Delilah just turned six. So far neither one of them has had it recommended for dental cleaning. I’m getting a bit nervous as they are getting up in age and it will be a big decision for me. Hey Jodi. Fortunately I often find dental disease affects the smaller sized dogs and those that are not on the raw meat diet. However, it is definitely still important to regularly check their teeth and make sure nothing is festering. I am sure Sampson & Delilah have great dental health. I would like to set your mind at ease, I have done heaps and heaps of dentals on very old patients and I have not lost a single one yet 🙂 under general anaesthetic so far. Yes there is always a risk but that applies for everything :-). You would have loved Castro, that’s for sure. so very very sad that you lost a patient. 😦 can you give any “hot” tips for extreme weather conditions? right now, it’s VERY cold here, and i often wonder, when the thermometers hit nine degrees fahrenheit, is it too cold for my princess? and same is true for the heat. when is too hot? i’d REALLY love to see a post on this from you. Extreme heat in Australia wow we are drowning in Washington State won’t stop raining. Outstanding blog! :} Have you worked on any donkeys yet in Australia? Love the 80’s look. Wait, I lived the 80’s look and let me tell you it was something else…lol. Too bad about Castro. We are always conscious of the heat in summer even though we have working dogs and they are conditioned, you just cannot be too careful. I have seen newbies at hunt tests who keep their dogs in their air conditioned cars and then get them out to run the test. Worst thing you can do. Imagine the shock to their systems. 80s look is pretty funky :-P. I totally agree that would be too extreme to take the dog out of an air conditioned car into the heat for a test.